Renoir first met Aline Charigot in late 1879. She soon became a favorite model and, in 1890, the artist's wife. Charigot probably posed for this portrait in 1885, soon after the birth of their first son, Pierre, while the family was in the countryside of eastern France. Renoir kept this intimate portrait all his life. Aline Charigot was working as a seamstress in the Montmartre section of Paris when she met Renoir about 1879 and began modeling for him. She appears in several of his paintings from the 1880s, including Luncheon of the Bathing Party (Phillips Collection, Washington, D.C.), and she became his mistress around the same time (they married in 1890). This is the first portrait Renoir painted of Aline, probably following the birth of their son Pierre in March 1885. It was most likely painted that summer, when they visited her home village of Essoyes in southern Champagne; the fresh light of the painting and Aline's jaunty straw hat, decorated with flowers, suggest a country setting, as does the simple cut of her jacket. The crisp use of line and contour is typical of Renoir's work of the mid-1880s, when in a crisis of confidence he felt the need to improve his painting and drawing technique. 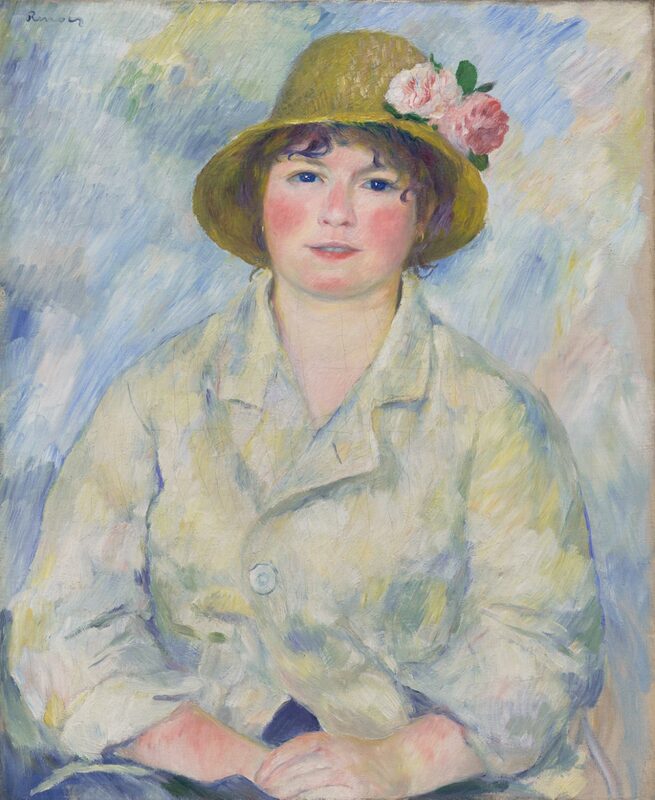 The hatched or close, parallel brushstrokes of the background may owe something to Cézanne, but the lively sense of color and the vivid flush of Aline's cheeks are undeniably Renoir's. They make this a deeply affectionate and personal portrait that he understandably kept all his life. Jennifer A. Thompson, from Masterpieces from the Philadelphia Museum of Art: Impressionism and Modern Art (2007), p. 82.